Karina Inkster is the owner and head fitness nut at Karina Inkster Healthy Living Academy, based in Vancouver, BC. With a Masters degree in Gerontology, she specializes in working with adults over 50, she also focuses on vegan and vegetarian clients. Karina has been weight training, swimming, running, cycling, and power yoga-ing her way to fitness since 2003. In 2011, she became a certified personal trainer to share her love for active living with others. My veganism began with vegetarianism. At the age of 11, I decided I wanted no part in the inhumane treatment of animals, and I aimed to enjoy a diet that had as small an impact on the environment as possible. I became vegan in 2003 (and had been vegetarian since 1998). I like knowing that I’m eating a diet that’s best for me – physically and psychologically – as well as for the planet. To me, veganism is the respect for and the celebration of all life on Earth. Veganism is a diet, a sense of interconnectedness with the web of life, a form of activism, and a lifestyle. I love weight training and swimming most. My training program varies with the seasons, but always involves 6 training days per week. In the spring and summer, I have debilitating pollen allergies and asthma, so I need to train indoors. During these months I weight train 4 days a week (2 upper body days and 2 lower body days) with short cardio and do 2 longer cardio sessions per week, which are usually swimming or running. After allergy season ends in the fall, I switch to more outdoor training such as running, plyometrics, and rope jumping, with 2 or 3 weight training days per week. When the weather gets too cold for outdoor training, I switch back to a higher volume of weight training and less cardio. 6 days per week, 8 hours total per week. Most definitely. I offer personal training at an exclusive training studio in Vancouver, along with nutritional counseling and online fitness coaching for vegans and vegetarians. 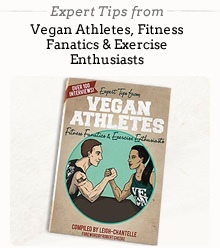 Unfortunately, some people think that veganism and athleticism don’t mix. On the contrary! A well-planned and balanced plant-based diet can support an athletic lifestyle very well, whether it’s focused on endurance, speed, or strength. The “But where do you get your protein?” question is thankfully becoming old news. I work hard to maintain a high level of fitness, and aim to be a walking billboard for healthy veganism. My strengths are in speed and in muscle strength. I’m a fast swimmer but wouldn’t last in endurance events, and my love of weight training translates into strong muscles. I deal with a potentially life-threatening condition called food-dependent exercise - induced anaphylaxis, which prohibits me from training after having eaten within 8 hours, in case a food triggers a serious allergic reaction when coupled with exercise. I also face severe seasonal allergies and asthma that limit my activity for 5 months each year, as well as weekly allergy shots after which I can’t train - again due to anaphylaxis risk. This means I have to carefully schedule all my workouts, and always train in the mornings (sometimes at 5am so I can get it in before work) after having eaten only oatmeal – a known “safe” food. I also went through full time graduate school while working 3 jobs and still managed to train 6 days per week. I’m motivated to help others to overcome their barriers, too. Generally I encounter support for veganism in the industry, especially considering vegan fitness is a growing trend. Most definitely. Two of my best friends are vegans and some of my family members are vegetarian. I cook delicious meals (if I may say so myself) that my non-vegan family and friends always enjoy. Q: "So, what do you eat?" I usually give them a brief list of cuisine types (Thai, Indian, Japanese) as well as some lesser-known foods (amaranth, tempeh, dulce, anyone?) to get them thinking about broadening their food horizons. Feeling and seeing the results of my lifestyle are great fuel to keep it going. I feel great, and want to keep it that way. I also want to help others – whether or not they’re vegan – to achieve their own results, which is motivation for me to be my best. Breakfast - I eat oatmeal for breakfast every single day. Because of my food allergy - and exercise-related condition [see above], I need to eat totally plain oatmeal before workouts. After working out, I eat a second breakfast, which is often flax waffles with peanut butter, or a smoothie. or something heartier such as veggie chili or stew. I also often make tofu scramble with lots of veggies. Dinner - Any number of stews, soups, curries, or stir-fries, and sometimes something more fancy such as roasted marinated veggie skewers or lentils and veggies wrapped in spelt phyllo. Snacks (healthy & not-so healthy) - I love dark chocolate. I also snack on protein bars, fruit leather, smoothies, crunchy roasted chickpeas, rice crackers with peanut butter or hummus, and much more. Calcium - Fortified soy or rice milk - I would eat almonds if I could, but I'm allergic to tree nuts. Iron - Edamame, lentils, quinoa, and spinach. I find matcha green tea to be a long-lasting energy source - given the tea leaves are ingested rather than steeped. Gaining muscle - You need to challenge yourself with the amount of weight you're lifting at the gym. Switch between low rep, high weight days and high rep, low weight days. You must also incorporate lots of recovery time (24 - 48 hours) for muscles to grow. Losing weight - Consistency is key. Stick to a regular healthy eating regimen and a regular workout schedule, and results will follow. Maintaining weight - It's worth speaking with a dietician to find out approximately how many calories you should be consuming per day, based on your needs and activity level. This number will be different for everyone. Improving metabolism - There's a reason everyone says, "Eat smaller meals throughout the day instead of 3 big meals." It works! So, get out there and do it. I eat up to 15 times per day, but small amounts each time. Toning up - Don't be afraid to lift heavy at the gym (I'm talking to you, ladies.) You don't need to weight train with heavy weights all the time, but lifting 5lb "beauty bells" at the gym will do nothing for your physique. I aim to live by example. I share delicious foods and fitness knowledge, and I incorporate veganism whenever appropriate. It's not about preaching and making veganism overt, but rather providing inspiring examples and using veganism as a background reason and motivation for what I do. Results - things people can see and taste - are more inspiring than statements.